Nestea Iced tea in powdered form from Nestlé turns into a sweet thirst-quencher when mixed with water, and is most sought after especially during the summer season, which is like almost every day in the Philippines. 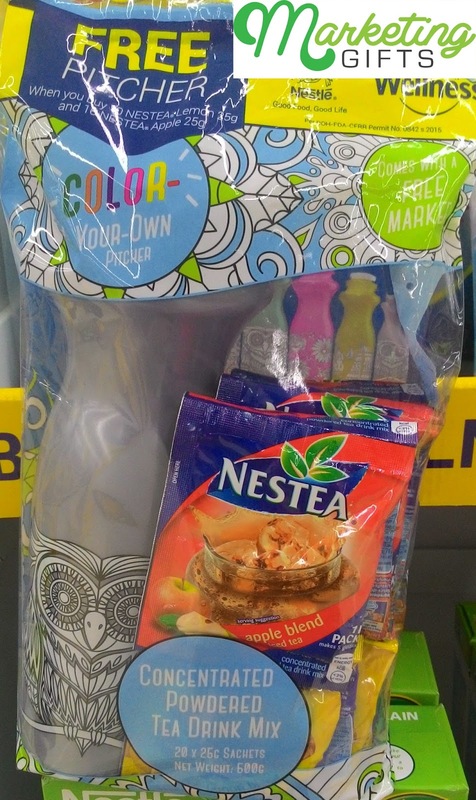 To make matters extra remarkable, they are giving away a pitcher for free with marker when you purchase 10 packets each of Nestea’s Lemon and Apple blends. Molded from High-Quality Materials. We have seen these gifts with purchase out of the package, and the plastic used specifically for the promotional pitcher is very sturdy. There is no way that it will crack even if someone accidentally lets go of it. Low-Cost. Buying the packets that go with the free pitcher and free marker will not require shedding off a lot of cash. Consumers, for this reason, will appreciate that this is low-cost, and then will want to buy more for later weeks. Very Useful. What is great about these promotional products is that even when the people run out of Nestea concentrated mix, they can still use the pitcher and the marker after that. Check out other marketing strategies in our Marketing Gifts blog, or contact us with any inquiries for custom promotional merchandise.